Working together, farmers can and do make a difference. Agri-Mark's rich tradition as a cooperative dates back to 1916 with the formation of its predecessor, the New England Milk Producers Association. The cooperative flourished during the twentieth century and in 1980 became Agri-Mark. A dozen years later Agri-Mark merged with Cabot Creamery Cooperative, thereby ensuring that Northeast dairy farmers would continue their ownership of a valuable, time-honored consumer brand -- Cabot. Naturally aged Vermont cheddar cheese and fresh creamery butter top the list of Cabot's best known products. In 2003, Agri-Mark merged with the Chateaugay Cooperative in Upstate New York and acquired the assets of McCadam Cheese, including a plant located in Chateaugay. McCadam manufactures award-winning New York Cheddar, Muenster and European-type cheeses. Agri-Mark farmers take pride in their Cabot and McCadam products and have the toughest milk quality standards in the market. If you enjoy healthy, delicious, award-winning dairy products, you can count on the fact that the pride of both our farmers and our employees are vital ingredients in everything we make. 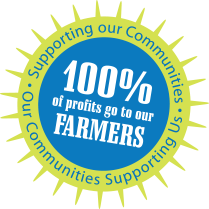 And remember, when you buy Cabot and McCadam dairy products, you are directly supporting more than one third of the dairy farm families in New England! Agri-Mark Whey and Dairy Protein Products?